German Shepherd full service Dog Training at Purebred Dog Training - visit our official website, click here. At Gunbil German shepherds, we offer a broad range of dog training options through our World Class Gunbil German Shepherd Dog Training. We train all breeds of dogs small, big and in between, all ages and all levels of obedience. We offer group, private and in-home lessons, and custom board and train programs designed to meet the needs of you and your canine friend. We can help with most dog related problems from house breaking to aggression problems. Whether you and your dog like to "show your thing" in public in group classes or prefer more personalized instruction with our world-class private lessons, we can accommodate all your world class German shepherd dog training needs. We also offer world class German shepherd dog specialized training such as AKC Competitive Obedience and Agility not to mention a truly a World Class Gunbil German Shepherd Dog Training with schutzhund in all phases of titles, including korung (breed surveys). In our world class German shepherd dog training facilities in Germany we have obtain many, many titles for our German shepherd clients world wide. No matter what you do with your dog, World Class Gunbil German Shepherd Dog Training is your premiere choice in Colorado or world-wide. At World Class Gunbil German Shepherd Dog Training we are an authority when it comes to behavior modification and obedience training. Contact us today so we can help start your best friend down a path that leads to of a lifetime of loyalty, devotion and positive behavior! NOTE: (OUR TRAINING FEES OR DEPOSITS ARE NON REFUNDABLE - IT IS TRANSFERABLE). At Gunbil German shepherds training program we offer this unique opportunity for your new puppy. Gunbil, "Puppy Imprinting and Socialization Program, is a 10 day course for puppies aged 8 weeks to 4 months. This training option provides your puppy a head start in their new life! There is a special period of learning that occurs during puppyhood, which enables young dogs to quickly absorb information about their world and how to react to it. Each experience defines your puppy's future behavior and dictates how they will respond to humans. Gunbil German Shepherd Puppy Program teaches young dogs to see humans as their leader, understand rules and boundaries, and imprints each foundational command upon which all future obedience skills are built. This all comes together to create a young, confident dog well on its way to becoming your ideal family companion. Puppy Development and Puppy Imprinting Training - Puppy Imprinting and Socialization Program with Basic Obedience Skills and Manners Program - This is a 3 week course. Ages 8 weeks and older. Upon successful completion of this program, your puppy will have a great understanding of 6 voice commands (heel, sit, down, stay, come) and hand signals, and perform them while under real world distractions and in home and family environment. Commands learned include: heel, sit, down, stay, come. sit/stay 1 to 4 minute long/down/stay, 1 to 4 minute, come to a front sit, heeling and go to your place (2/4 minute long "Puppy" boundary command – PLACE).. This package also includes professional Crate Training and Potty Training of your puppy! We also teach social manners such as sitting politely for petting, no jumping, waiting at doorways to enter/exit house and before getting in and out of a vehicle, moving out of the way, and leave it. Our Gunbil German Shepherd Puppy in our home training package offers busy pet owners the solution of having a professional train their dog for them. This results oriented, fully customizable in our home training package is designed with you and our Gunbil German Shepherd Dog professional/s to ensure your obedience and behavior modification requirements are achieved during your dog's one to three week stay with us in our homes. Quality Care in OUR HOME with our Family Environment (Not Kenneled). Creating a stimulating environment, the enrichment of your dogs daily life procedures within the family. Walks and car rides are a vital part of your puppies socializing opportunities, including out and about near various people, hear and see traffic, learn to ignore bikes, walk over different surfaces and going to dog parks (approved by us). Plenty of exercise and playtime with family and children, visiting places daily, including teaching your new puppy/dog proper and professional socialization skills, building confidence in your dog and strengthening his focusing ability for a secure and safe in nature character. Personalized and professional care with our family to enrich the dog’s life and alleviate the boredom as well as stop the development of “bad” behaviors. Your puppy will exceed your expectations with impressive results! Basic Obedience Skills and Manners Program - This is a 2 weeks course. Ages 9 weeks and older. Upon successful completion of this program, your dog will have a solid understanding of 10 voice commands and hand signals, and perform them while under real world distractions. Commands learned include: sit/stay 40 minute long down/stay, come to a front sit, heeling and go to your place (40 minute long boundary command). We also teach social manners such as sitting politely for petting, no jumping, waiting at doorways and before getting in and out of a vehicle, moving out of the way, and leave it. Our Gunbil German Shepherd Dog Board and Train School offers busy pet owners the solution of having a professional train their dog for them. This results oriented, fully customizable Board and Train program is designed with you and an our Gunbil German Shepherd Dog professional to ensure your obedience and behavior modification requirements are achieved during your dog's one to three week stay with us. Three private follow-up lessons ensure a complete understanding of how to maintain your dog's new skills and positive behaviors. Expect impressive results! 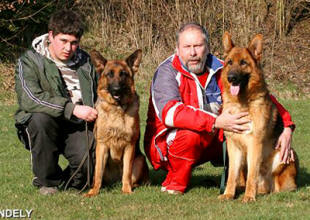 Our World Class Gunbil German Shepherd Dog Training In-home lessons offer the ideal training environment. We focus one-on-one sessions to modify misbehaviors, teach obedience skills and learn effective leadership techniques. Lesson 1:30 hours (time period), Monument and Larkspur area $148.00 per lesson, in Colorado Springs and Denver area $188.00 per lesson. AKC's Rally-O (Novice to Excellent) and Companion Dog Title Training AKC competitive obedience training is offered through personalized instruction. Please call for details. 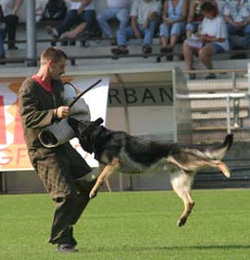 Our "professional" expert Schutzhund trainers in Germany have obtain many titles with TOP world-class German shepherd dogs in the field of schutzhund. Our accomplishments are proven and shown in the "Sieger" shows all over the world. This is our full time job and not a weekend adventure. If your serious about titling your German shepherd dog in all phases of Schutzhund, Günbil German shepherd professional schutzhund training in Germany can help you obtain your goal, guaranteed!. Approximate cost from USA to Frankfurt, Germany is $3,888.00 (round-trip). 500 Series Crate minimum (Airline Approved) which you must supply. International USDA certified health certificate is required (Revised 12/06/04). Download the NEW International "EU" non commercial Health Certificate.